In epidemiological analyses, glycated hemoglobin (A1C) levels >7.0% are associated with a significantly increased risk of both microvascular and macrovascular complications, regardless of underlying treatment. Both fasting plasma glucose (FPG) and postprandial plasma glucose (PPG) are directly correlated to the risk of complications, with some evidence that postprandial might constitute a stronger risk factor for cardiovascular (CV) complications. Evidence from the Diabetes Control and Complications Trial (DCCT) and the United Kingdom Prospective Diabetes Study (UKPDS) suggests that improved glycemic control reduces the risk of microvascular complications but has no significant effect on macrovascular outcomes in recently diagnosed type 1 and type 2 diabetes, as well as more long-standing type 2 diabetes. Subsequent observational data from long-term follow-up of both the DCCT and UKPDS cohorts showed a persistence of significant microvascular benefits in patients who had previously been in the intensively treated groups, despite the fact that during the subsequent follow-up period their glycemic control became similar to that of patients who were previously in the standard arm. In the DCCT cohort, there was a significant reduction in CV outcomes (42%) as well as non-fatal MI, stroke and CV death (57%) in previously intensively treated patients compared with those who were previously in the standard arm. Similarly, there was a significant reduction in MI (15%–33%) and all-cause mortality (13%–27%) in the UKPDS cohort in patients who had been originally randomized to intensive treatment. The Action to Control Cardiovascular Risk in Diabetes (ACCORD) trial randomly assigned 10,251 patients to intensive therapy targeting an A1C <6.0% or standard therapy targeting an AIC level of 7.0% to 7.9%. Patients included had either a previous history of CVD or multiple risk factors for CVD, and a baseline A1C level ≥7.5%. A difference in A1C was rapidly obtained and maintained throughout the trial at 6.4% and 7.5% in the intensive and standard therapy groups, respectively. The intensive glucose control arm was prematurely terminated after 3.5 years due to higher mortality associated with assignment to this treatment. Intensive therapy showed a favourable effect on microvascular outcomes, particularly albuminuria and diabetic retinopathy. The Action in Diabetes and Vascular Disease: Preterax and Diamicron MR Controlled Evaluation (ADVANCE) trial randomly assigned 11,140 patients to standard (targeting A1C based on local guidelines) or intensive glucose control therapy aimed at reducing A1C levels to ≤6.5%. Patients were at least 55 years old with a history of major macrovascular or microvascular disease or at least 1 other risk factor for vascular disease. After a 5-year follow-up, mean A1C was 6.5% in the intensive group and 7.3% in the standard group. Patients in the intensive control group demonstrated a reduction in the incidence of major microvascular events, mainly through a 21% relative reduction in nephropathy. The Veterans Affairs Diabetes Trial (VADT) randomly assigned 1791 United States military veterans with poor glycemic control (≥7.5%) to standard or intensive glucose therapy, which aimed for an overall reduction in A1C levels by 1.5%. Following a median follow-up of 5.6 years, A1C levels were 8.4% and 6.9% in the standard and intensive therapy groups, respectively. Progression to albuminuria was significantly reduced in the intensive-treatment patients, with 9.1% of patients having significantly reduced progression compared to 13.8% in the standard therapy group. None of the above studies independently confirmed a significant benefit of tight glycemic control on macrovascular outcomes. However, meta-analysis of clinical trials demonstrated that patients treated with more intensive glycemic therapy, compared to less intensive glycemic control, were found to have a 10% to 15% reduction in the risk of major CV events, primarily because of a 15% reduced risk of MI, but with no effect on stroke, CV death or all cause mortality. Intensive glycemic control was associated with more than a 2-fold increase in the risk of severe hypoglycemia. Several potential reasons have been suggested for the unexpected higher mortality rates seen in the intensive arm of the ACCORD study and the lack of clear macrovascular benefit in the ADVANCE and VADT trials. These include patient age, duration of diabetes, presence of CVD, history of severe hypoglycemic events, weight gain and the rapid decrease in A1C values. These findings suggest that microvascular and macrovascular events may be reduced by intensifying therapy targeting an A1C <7.0% in younger patients with recently diagnosed diabetes and a lower initial A1C value but with an increased risk of hypoglycemic risk. Individualized and higher A1C targets may be indicated in older type 2 patients with longer duration of diabetes, established CV risk factors, severe hypoglycemia episodes and/or without A1C reduction despite treatment intensification. Similarly, individualization of A1C targets may be needed in some patients with type 1 diabetes who are unable to achieve an A1C <7.0% without being at increased risk of severe hypoglycemia. In order to achieve an A1C ≤7.0%, people with diabetes should aim for: FPG or preprandial PG target of 4.0–7.0 mmol/L and a 2-hour PPG target of 5.0–10.0 mmol/L [Grade B, Level 2 for type 1; Grade B, Level 2 for type 2 diabetes]. A1C measurement is a component of both the FPG and PPG. When A1C values are higher, the major contribution is the FPG levels, but as the A1C value approaches the target value of ≤7.0%, there is a greater contribution from PPG values. If an A1C target ≤7.0% cannot be achieved with a PPG target of 5.0–10.0 mmol/L, further PPG lowering to 5.0–8.0 mmol/L should be achieved [Grade D, Consensus, for type 1 diabetes; Grade D, Level 4, for type 2 diabetes]. Glycemic targets should be individualized based on age, duration of diabetes, risk of severe hypoglycemia, presence or absence of cardiovascular disease, and life expectancy [Grade D, Consensus]. 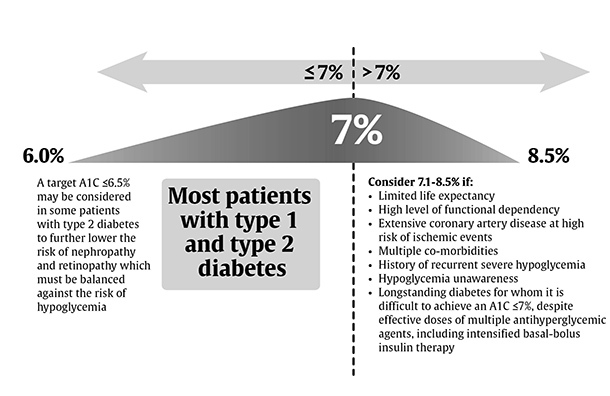 Therapy in most individuals with type 1 or type 2 diabetes should be targeted to achieve an A1C ≤7.0% in order to reduce the risk of microvascular [Grade A, Level 1A] and, if implemented early in the course of disease, macrovascular complications [Grade B, Level 3] . An A1C ≤6.5% may be targeted in some patients with type 2 diabetes, such as those with a shorter duration of diabetes, no evidence of significant CVD and longer life expectancy, to further lower the risk of nephropathy [Grade A, Level 1] and retinopathy [Grade A, Level 1], but this must be balanced against the risk of hypoglycemia [Grade A, Level 1]. Individualizing your patient's A1C target – an interactive tool. What A1C should I target? – quick reference guide. If you would like more details on this topic, including references, please visit the Canadian Diabetes Association Clinical Practice Guidelines: Chapter 8.